Anticipation: Rabbit Dragon and teammates waiting for their turn to bat at the big diamond during a fundraiser. Ironic, when Monster Daddy was getting all excited by the start of Little League season, I was apprehensively looking forward to Rabbit Dragon's first time in the little league. My dad cleared it up for me, one day while watching one of Rabbit Dragon's little league games. Turns out that back when I was a boy, the local LL teams really played to win. Because I sucked, I warmed the bench most of the time. No wonder I remember little league as a downer. Those experiences soured me on team sports all through school. I hope that Rabbit Dragon's postive experience becomes a positive influence on his life. Nakko & I spent our Memorial Day weekend rearranging the nursery and laundering all the baby clothes we've bought/received. We read somewhere that it was necesarry to wash all our baby's clothing before she's born, so we did. The other reason that necessitated our weekend laundry adventure was that I grabbed all the Dreft samples given out at our last birthing class. That isn't considered stealing, is it? They were "free samples" after all. I didn't see any signage about two-sample limits. Then again, my parents used to own a Chinese Buffet and curse the customers who'd stuff egg rolls in their pockets. My god, what kind of example am I be setting for our unborn daughter?! Anyway, after we washed her clothes, came the task of folding everything. The title of this post is a little misleading, since folding the onesies wasn't all that difficult. I just like typing "onesie." The real pains were the pajamas with booties and theses kimono-esque outfits my parents brought back from Hong Kong. There are all these ribbons and bows we don't know what to do with. See, my wife and I have a pretty structured system of folding the laundry. You should see us folding t-shirts, boxers, socks, jeans, what-have-you; we're the freakin' Gap on laundry nights! But these tiny little clothes have pretty much left us befuddled. Just what the heck is a rice daddy and what is the relationship between fatherhood and Asian American-hood? What are the differences in identity politics between our generation and our kids' gen? Please be kind to the fact that this was a first-time thing and we're still learning the proverbial ropes. That said, if you want to hear more, let us know too since we'd like to turn this into a regular feature rotating through all the Daddies in the house. Thanks to Instant Yang for setting up the tech, and to him, Henri and DISL for participating! The wife's away on business, so I figured Baby and I would chill with some old friends in the East Village. It was a rare reunion of "Team Chaos," the group of troopers that came all the way to the Philippines for our wedding three years ago. Though most of us all live nearby, it's not often that we all get together as a group. Matt the (jazz bassist) just moved here from Chicago, Anna (my groomsmaid) has always lived here in Manhattan, Dan ("Danimal the Animal") was visiting from Austin, and Bill (the hippie veterinarian) just moved downtown from upstate NY. My buddy Gil (Baby's godfather) joined us later on. The reason we got together this Memorial Day was cuz Dan was here on business. But the real excuse for bringing Baby out is cuz I needed to prove to myself that I wasn't gonna be "that" kind of father, who moves out to the 'burbs, drives a minivan, and goes into social hibernation. I'd brought Baby to bars before, but today was just one big "round the world" beerfest. Now that smoking is prohibited in most bars these days, I think more and more Americans are bringing their kids to the pub. Not that smoking has ever stopped people from doing so... When we were in grad school in the UK years ago, I remember always seeing kids, (even babies!) hanging with their parents in smoky pubs. It was a great time, and uncle Dan's first time to meet Baby. It was just like our college days, except that instead of a drunk and stoned ferret, we had Baby in tow. Baby took a monster dump. I took her down to the dingy, dark, men's room to change her, noxious piss and sticky beer all over the floor. Typical East-Village hole-in-the-wall bar. I laid the changing pad and Baby on the toilet's porcelain water tank. It was such a narrow space, I had to keep my knee on the edge to keep Baby from rolling off into the toilet. Bill took a peek over the stall to see if we were okay. He said that if my wife had seen this she'd have freaked. Bill, the Park Avenue vet, said that feeding Baby is like feeding the baby kittens at work. Anna, your typical chinoiserie-obsessed fashionista Manhattanite (she just got back from Thailand) took it upon herself to carry baby whilst sashaying down the street. Asian Baby as her newest fashion accessory. Anna's nickname for the day was Angelina. My sister had "borrowed" Baby's stroller. So I had no choice but to "Bjorn" it around town. It was a blessing, as I've just discovered how much easier it is to get around the crowded subway without a stroller. If I needed to put the baby down, the travel high chair came in handy. Some bar tables are so high that they can get top-heavy with that travel high chair on, so you gotta be careful where you put it. When Gil walked into one of the bars holding Baby, I tried to play it off like we were one of those "21st century families," but when people asked about her, he was quick to point out that I was the father and Mommy was in London. Oh well, being a straight dad in Manhattan might not be as fashionable, but it ain't so bad. You know you've got a great bartender when she not only can make a mean G&T, but she can also rock a crying baby to sleep. My obsessive-compulsive self tried real hard not to stop Baby from chewing on the edge of the sticky bar. The rationale is that she needs to lick all sorts of crap now, and if it doesn't kill her, it'll make her stronger. Oh, and I'm trying not to have a problem with strangers poking at her chubby cheeks. The rationale is that evolution made babies' cheeks chubby for a reason: so strangers would poke at 'em. The more strangers, the more immunity to disease. When trying not to be obsessive-compulsive, alcohol always helps. I'll have a photo of our exploits posted shortly. Remember that day you came home after golfing and you were both so happy because it had been so long since the last time you had gone, I think like at least 12 hours or something crazy like that, and you saw me crying in the kitchen and you asked what was wrong and I opened my heart to you to tell you that I didn’t get into Harvard? Do you remember how Dad yelled and said he knew I would fail if I didn’t go to private High School and how Mom, you yelled at Dad for not making enough money to pay for the SAT tutor in 3rd grade instead of waiting till 8th grade and Dad do you remember yelling at me why I couldn’t study harder like Soo-Yun and Ha-Sook and Grace and Grace Lee and Grace Park or Grace Min or Grace Kim or Grace J. Kim or Grace Lee or Little Grace Pak or Grace Hong or Big Grace? I felt so horrible. So when Mom tried to sooth you by saying Yale wasn’t so bad I had to lie and say Yale didn’t have KBS club so you would feel OK about me not going there because the truth is I didn’t get into Yale either. I didn’t get into Brown or Princeton or MIT or Duke or Columbia either. But I couldn’t stand it anymore and I blurted out that I got into Stanford. I remember how you muttered how lucky I was to get into a backup school like Standford and Mom clucked her tongue and said it doesn’t matter as long as I met a good boy to marry. I felt so bad but what else could I do. It’s your entire fault anyway. Do you know how hard it is to study when growing up as hard as I had it? You both put pressure on me to study. To study! You think studying is easy? Just because Dad you grew up during the Korean war and had to eat snow and pine tree roots with your cousin going from farm to farm to do day labor and collect firewood with only the memory of your dead parents to warm your heart as you tried not to cry every day because the tears would freeze your eyelids shut and keep you from finding bugs to eat doesn’t mean you know how hard it is these days. You didn’t grow up here in America. Studying is HARD and you and Mom put pressure on me. Just because Mom had to work as a seamstress for 16 hours a day without a break and being yelled at by her boss for getting up to go to the bathroom and not eating lunch for 9 years until Dad and you scraped up enough money to open a tiny liquor store where Mom you could work for 17 hours a day and have a gun pointed in your face 5 times and got beat up twice, doesn’t mean you can make me feel like you only love me for studying and nothing else. I had to lie because you think studying is so easy. Remember when you bought me the Civic? I was so embarrassed driving to school in it. Everyone stared at me and I had to pretend it was a rental while the Lexus was in the auto shop for two years. I even made a little Hertz rental sticker for the bumper. I told my friends that my new Lexus was in the shop for two years because the stereo system being installed was very very very custom. And remember when you wouldn’t let me stay overnight for the prom? I was so mortified I had to tell my friends that I had to go to the airport to catch a trip to Paris to go to a Prom there too. Remember when you didn’t let me change my name because you said I should be proud of being Korean? Guess what I changed it as soon as I turned 18. Its now Azia with a Z as in lazy. You both think I’m lazy but I tried my best and you always said that’s all that mattered as long as it ended in ultimate success. What I really wanted to say is that I’m sorry. I didn’t mean to lie, but it only takes a few minutes which turn into days which turn into weeks which turn into months before you realized that you’re trapped. I was trapped and I’m sorry and all I want more than anything is to just go back and start all over. I just wanted to make you proud. Really that’s all I wanted. Please send money, Stanford is expensive. Korean American woman pretends to be Stanford student for eight months. This should be a valuable lesson to us as Asian parents: chill on the collegiate pressure! We should be open to our kids being imposters at state schools too, not just Stanford. But anyway, yeah, I got the Father's Day catalog from expensive-gift-company Red Envelope in the mail yesterday, and smack me upside the head if the the cover model isn't a hapa-ish Asian American dad playing with his three hapa-ish children (the pic from the website cuts the third kid out of the frame). The rest of the catalog, which is always reliably diverse in its choice of models, features an array of multiculti dads-and-children images. And yeah, I know, it's just a catalog and they're just trying to sell me stuff I don't need, but it's still nice to see that dude on the cover. MetroDad's Peanut thinks all Asian men are her daddy... Heh. Our own MetroDad, who hasn't been seen in these parts for quite some time [sniff, we miss you, MD! come back! ], has a post up on Babble's StrollerDerby (which is run, by the way, by our sistah-blogger CityMama) about how his own Peanut has fallen prey to the all-Asians-look-the-same myth, at least when it comes to her dear daddy and a certain major league baseball player of East Asian extraction. Heh. Go read it. Over the weekend, Nakko and I attended the first of three birthing classes at the hospital, and it finally dawned on me that our lives are going to be forever changed. (You'd think it would've hit me in the seven months since finding out.) I don't know if it was all the information we had to download from 10AM to 3:30PM, but some time in the middle of a breathing lecture, I looked over at my wife and started to imagine what the day would be like, and it was scary. Moreso because, even after watching some of the videos (and we've yet to watch the real graphic ones) it's impossible to expect how things will pan out. But that's when it hit me: one day, come this July, life as we know it will be over. Re-reading that last sentence, I realize how ominous it sounds. Here's the thing, though: I can't wait! It's weird, really. There's a lot of fear and anxiety mixed in with the joy and excitement. Guess this is what it means to be "expecting." Since October, when we found out about the baby, we've been preparing for the day Kiki will come into our lives. After a pretty rough first trimester (I never realized my wife could vomit so much), life hadn't changed all that much. Sure, Nakko's belly was slowly-but-surely expanding, and Kiki was definitely moving around in there, but our daily routine was pretty much unchanged. Well, except for buying a ton of baby clothes (that's not an exaggeration! ), reading to my wife's belly, nightly leg/foot/back rubs, trying several different kinds of strawberry smoothies... Okay, so maybe things are different. All that's left are the sleepless nights and poopy diapers, I guess. Games/Sports does not Build Character, it REVEALS IT! Sorry I've been MIA. My dad's has been having health issues and I've had issues with my son's baseball coach. The whole situation with my son's coach has been appalling and ate up all my time. In short, in Little League all the Managers are volunteers. Our coach seemed very nice at first but knew very little about baseball so I offered to volunteer as an Asst. Coach (my work won't allow me to commit as a Manager.) If he was just inexperienced that's OK with me. But he turned out to be a complete control freak and what was worse was his inability to handle losing - he would be completely negative and blame the kids! 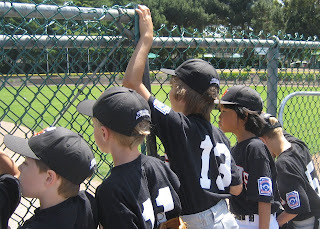 During this one game we started off losing and he was actually sulking in the dugout and gave up on the game. Then he's yelling at the ump's calls and cursing his own kid. And the coup'd grace was his pep talk to the kids was basically "you stunk!" I decided I needed to talk to him about it in a calm manner later. His response was immediately, "I don't want any more confrontations with you. (What confrontation???) So maybe it's best you go back to the stands." Yeah, what an A-HOLE! Afterwards I found out other parents heard his "pep" talk. While some were as appalled as I was, some idiot dads actually think it was good for their kids. Worse, I couldn't get enough parents interested enough to can him. Apathy at its best. The whole episode reminded me of the old adage; "Sports doesn't build character, it reveals it." While this coach had a nice guy veneer he was a complete sociopath inside. I believe sports are really great for kids, especially team sports. But as parents, we really need to watch who is in a position of influence with our kids and be extra extra wary. I've learned the hard way; you never know the character of any person, even an adult until their character is tested. As reported everywhere, a recent Salary.com survey calculates that the job a stay-at-home mother performs would command a whopping $138K salary. This is an outrageous injustice, as a stay-at-home dad commands a virtual salary of at least $175K. 1st Annual APA Book Festival Focuses on Family - Tomorrow! Soulsnax's last post asked how we're observing Asian Pacific American Heritage Month [hat-tip to Angry Asian Man for the informational link]. Well, if you're in Southern California, there's an awesome new event happening tomorrow, Saturday, May 12, from 11 a.m. to 4 p.m. at the Japanese American National Museum in downtown LA's Little Tokyo: the inaugural Asian Pacific American Book Festival. Jetlag permitting [yes, we just got back from our big trip to the Philippines, and I'm gonna write about it soon, I promise—with pix! ], I'm driving down to go—just check out the line-up of panel topics and participants and book signings and you'll see why. The theme of this first-ever event, sponsored by the Asian Pacific American Legal Consortium, is family, in all its permutations and meanings [and includes children's events and children's book authors]. For readers and writers at the intersection of race, culture, family, and parenthood, this is definitely looking like an event not to be missed. Maybe I'll see you there! May is APA Heritage Month. 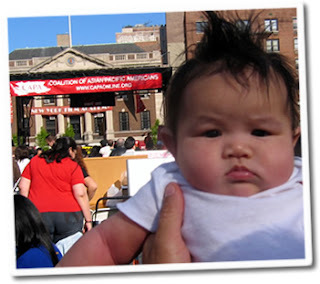 To kick off the month, my wife and I took our baby daughter to the 28th annual Coalition of Asian Pacific Americans (CAPA) Festival here in New York. Yeah, I know at 4 months old it might be a little early to begin our daughter's edumacation in the role of Asian heritage in America. But having had a winter baby means that it's been many moons since we entered parental hibernation, and cabin fever sure has taken its toll on our social life. It was great to see our old friends in the community and our fellow foot soldiers in the struggle for collective empowerment. Oh, and of course, it was the perfect chance for us to show off our little chubster. With her gurgling, babbling and toothless smiles, she was a natural social butterfly. Made us proud to have added another to our ranks. I guess that "Maddox" hairstyle helped too. It's natural, hair stands up on its own. To sum up the festival, it was not much different from previous years. Performances from various dance ensembles, Asian-American bands, arts, crafts, and food booths. Needless to say, a fair bit of networking and some cross-pollination of social, cultural and political ideas, concepts and initiatives going on. Kinda like the blogosphere itself, but with a cool breeze, delectable edibles and lots of bubble tea. So what are you RiceDaddies doing to celebrate APA Heritage Month? Three more weeks to go, and I'd love to know what you all are doing. Any suggestions on how best to celebrate? What's going on in your neighborhoods and in your schools? Post your thoughts in the comments. UPDATE: Comments have been turned on. Thanks to Thisislarry for the heads-up!